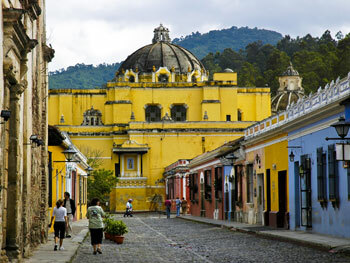 Antigua, a beautiful colonial town just a short drive from Guatemala City, is well-known for being a favourite amongst Spanish students. There is a myriad of reasons for this, such as: the pace and clarity of the Spanish spoken in Guatemala; the inexpensive living costs; its proximity to the capital and other sites of interest in the country; and its spectacular setting in a valley surrounded by three volcanoes. A quieter, safer option than the capital, Guatemala City, Antigua still has plenty to offer in terms of history and culture. In the evenings or at the weekends students can also explore Antigua's restaurants, internet cafes and bars, go to the cinema, learn to dance, and much more! 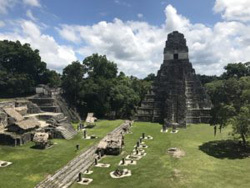 Independent tour operators can also organise single day or full weekend trips to attractions like the Mayan ruins in Tikal, Artisan and Coffee Tours, diving in Lake Atitlan, and even trips to the perfect beaches of Belize! The verdant heart of the city, Parque Central, is a gathering place for locals and visitors alike, making it the perfect place to practice your new-found Spanish skills! 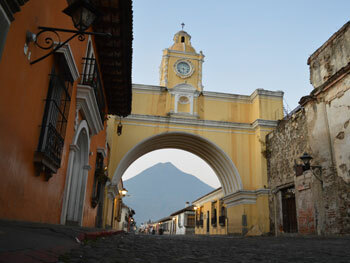 From here, explore the cobbled streets, lined with stunning baroque architecture, and feel yourself travel back to the 18th Century when Antigua was the colonial capital of Guatemala. You will encounter many shops selling traditional crafts, such as woodwork, basket-weaving and even jade, which was precious to the Mayans and holds a special place in Guatemalan culture. 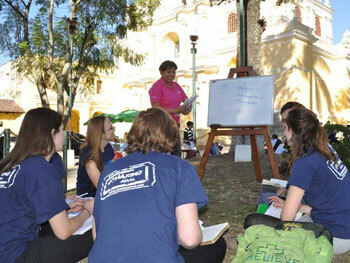 Our school in Antigua has two buildings, with the main school building located in a quiet area in the heart of the city, just a short walk from the main Plaza. It is comprised of 22 bright classrooms and a beautiful garden where you can study independently, chat to fellow students or simply soak up the glorious sunshine! The second building is situated just a few minutes away, where you can have classes outdoors on the rooftop terrace whilst enjoying stunning views of the city. 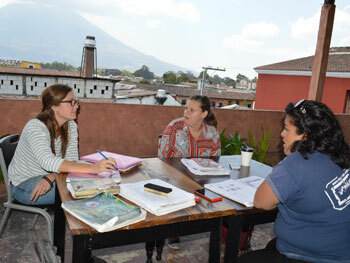 In Antigua, we can arrange Intensive Spanish courses of 20 lessons per week; combination courses, consisting of both group and private lessons; or, if you would like a completely tailor-made programme and more personalised learning, you can choose to take a course of private lessons only. Language groups are kept small, with 2-8 students in each class. This allows teachers to pay individual attention to each student and creates a relaxed, informal environment for your Spanish learning! Our school in Antigua offers host family accommodation, which is usually within 10-20 minutes walking distance from the school. Our colleagues at the school select the host families that they work with very carefully, in order to ensure that students are accommodated in suitable environments. 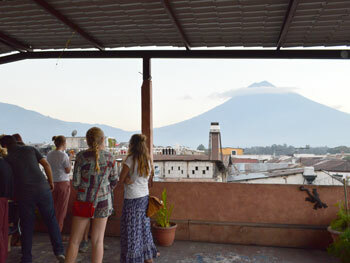 This is the perfect accommodation option to allow you to be totally immersed in the Spanish language and really experience the way of life in Antigua, Guatemala! 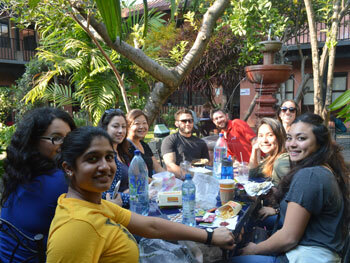 Accommodation is offered on a half-board basis, meaning that you will enjoy breakfast and dinner each day with your appointed host, giving you the perfect opportunity to sample local cuisine, learn about the customs and culture of Antigua and enjoy Spanish conversation over a tasty meal with native speakers of the language. 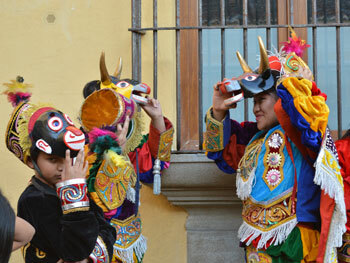 We believe that your language immersion programme would not be complete without our school’s weekly activity programme! Each week, our school organises extracurricular activities to help you make friends from all over the world and give you an insight into life in Antigua! 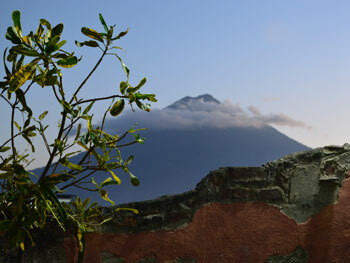 You can take salsa or cookery classes, participate in a tandem conversation programme, explore coffee farms, volcanoes and colonial ruins or visit the beautiful Lake Atitlan! Most students tend to fly into Guatemala City Airport. If you book host family accommodation with us, we can organise an airport transfer upon arrival, free of charge! 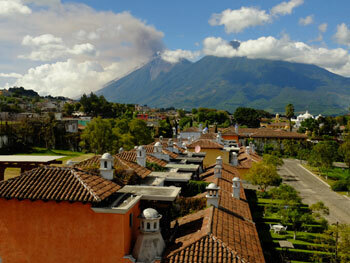 This summer I will be travelling to Antigua, Guatemala, where I will be following a Spanish course at our language school. 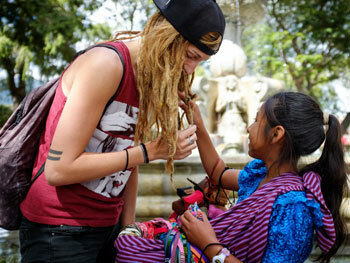 Falling in love in Antigua!